Static calculations for both general and corner building areas. Component guide and list pricing. 3D modelled thermal pointloss calculations. Specify a project specific exterior rainscreen cladding systems solution. The requirements for each façade and cladding system are always different and depend on factors such as local wind loads, height of the façade, substrate being fixed to, selected cladding material and the cladding zone. All NVELOPE cladding systems can be engineered to project specific requirements. 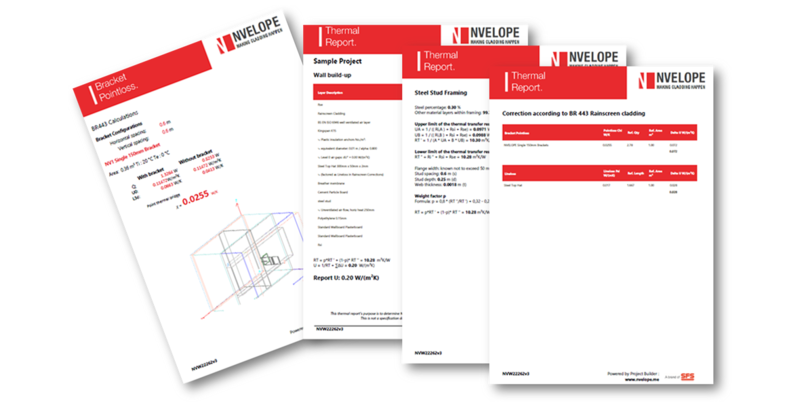 Unlock your cladding scheme by completing and submitting the NVELOPE project builder (ideally accompanied with elevation and plan AutoCAD drawings) indicating your proposed cladding requirements. 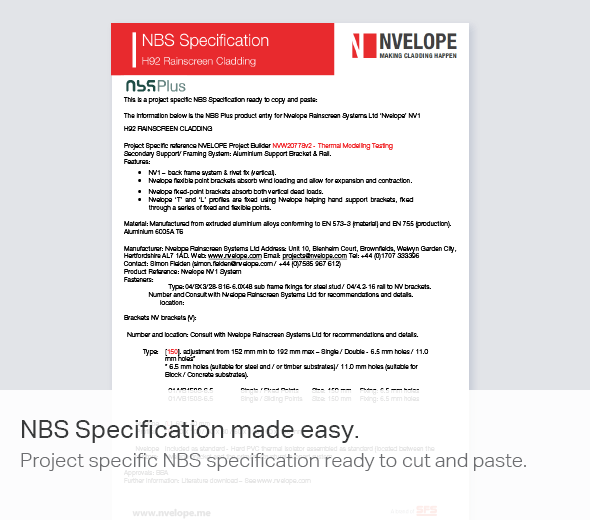 This will allow us to prepare a project specific NVELOPE cladding solution that includes indicative M2 rates, static calculations and setting out information for the support system. A static calculation assesses dynamic forces e.g. wind load and dead loads (weight of the cladding) under project circumstances. In engineering, static systems do not move or change state – therefore a static calculation ensures that under a given set of circumstances the system (mix of brackets and components) will not move and it will support the load that it's intended to support. NVELOPE Rainscreen Cladding bracket support systems and associated fixings have been designed in accordance with the new Eurocode 9 (EC9) and are implemented to National Annex BS EN1999. The EC9 provides common structural design rules, so meeting the compliance requirements of the EU. Plus Eurocodes have been recognised as the leading structural codes. Their flexibility enables use internationally, as evidenced by their adoption by several countries outside Europe. The Eurocode 9 (BS EN 1999-1-1 : 2007+A1 : 2009) applies to the design of structural works in aluminium and complies with the principles and requirements for the resistance, durability, serviceability and safety of aluminium structures. The power of a thermal expert with a few button clicks. 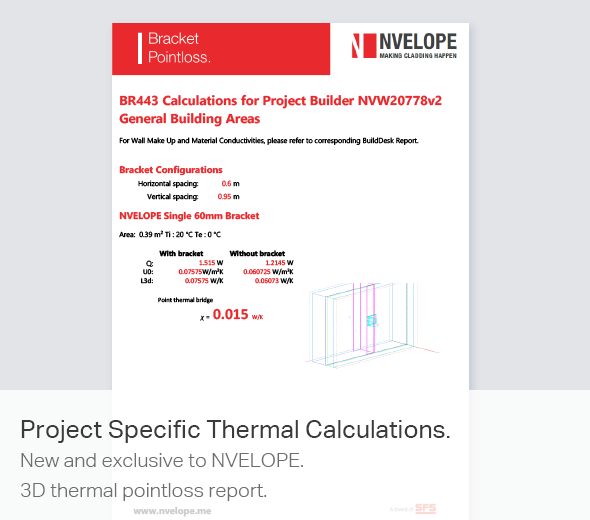 Project Builder’s latest powerful offering combines together the knowledge of powerful industry thermal software solutions to offer fast and easy project specific thermal calculations. Use Project Builder’s easy online form to submit your project information and based on the project specific calculations our technicians are able to generate project specific 3D thermal modelling to calculate each bracket’s pointloss value. Each change in the project build-up, whether a substrate, insulation thickness or type change requires a new bracket pointloss calculation. Project Builder has simplified this process and now offers this powerful feature as standard. 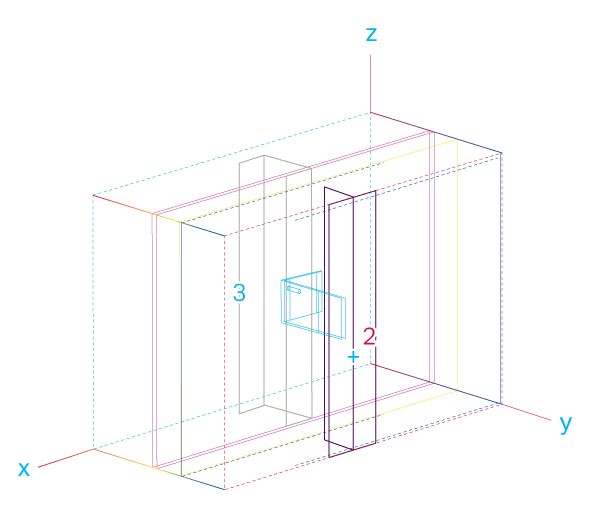 3D Thermal Pointloss calculations are bracket specific. 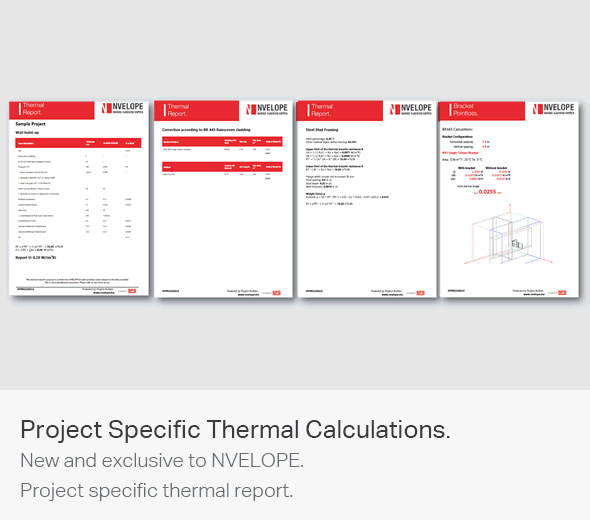 Our 3D thermal reporting calculations cannot be used with third party brackets. The calculations require 3D thermal modelling and any variance in the material, size or design will require new calculations. The pointloss chi calculated is exclusively for and only available for NVELOPE brackets. We do not offer this service for competitor brackets. Peace of mind. We’re using industry respected ‘HEAT3’ for 3D thermal pointloss modelling. 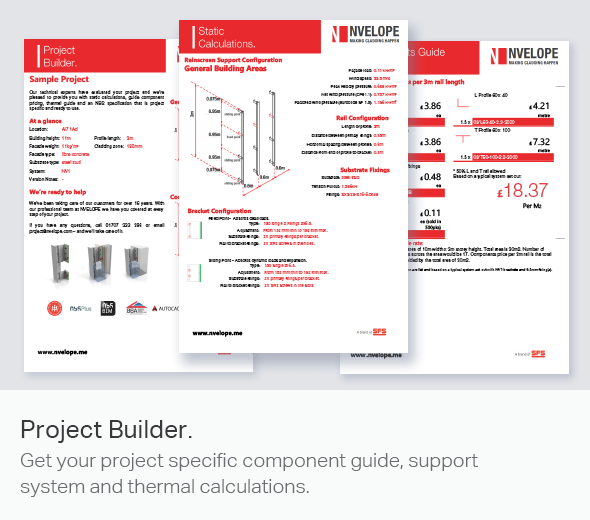 The BR443 report produced by the Project Builder's Thermal calculation software is created by replicating your project’s wall build-up in both 'HEAT3' and 'Project Builder'. The U-Value is the heat loss through an Element, e.g. a wall. © NVELOPE 2017 - NVELOPE is an NCASE Company. NVELOPE reserve the right to alter technical specifications - Always check with NVELOPE Rainscreen Systems Ltd.
You should read our terms and conditions carefully before using our services. By accessing or using our service, you agree to be bound by these terms and conditions. No proposed changes to these terms and conditions are valid or have any effect. If you do not agree with or accept these terms and conditions, you should cease using the service immediately. Our service is being supplied to you without charge for your general information purposes only and to inform you about us and our products and services. It does not constitute an offer or technical advice and should not be relied on for any such purpose. To the maximum extent permitted by law we exclude liability whether in contract, tort (including negligence), breach of statutory duty, or otherwise arising from your use of, or reliance on, the products or services we provide (except fraudulent misrepresentation and personal injury or death resulting directly from our negligence). Our calculation document is based on the information provided by you and it is therefore your responsibility to check the relevance and accuracy of the information provided. We make no investigations as to the accuracy of the information supplied in the process by you or third parties. This calculation document is issued for the party which requested it and only for the project named in it. It should not be relied upon by any other party or used for any other purpose. We accept no liability for the consequences of this document being relied upon by any other party, or being used for any other purpose, or containing any error or omission which is due in whole or in part to an error or omission in data supplied to us by you or other parties. Our calculation is based on the use of NVELOPE brackets and rails. Our calculation may refer to specific fixings which should not be substituted for fixings of an inferior specification. External wind pressures have been factored in to our calculations as 1.2 for general areas, and 1.5 for corner areas (for most onerous cases / loading conditions) as based on BS6399-Pt2-1997. Wind speeds have been calculated to BS6399-Pt2-1997 using BREVe 3.2. If there are specific project related questions related to wind pressures or wind speeds to be used for a specific calculation, please either contact your Project Engineer -or- NVELOPE on 01707 333 396. All intellectual property rights in this service and in any materials which may be provided to you as a result of using this service are retained by NVELOPE. You may not copy, distribute, revise, reproduce or create derivative works from this document. NVELOPE are here to help - For further information or assistance related to this service in general -or- this calculation document specifically, please make direct contact with (or request your Project Engineer to make direct contact with ) NVELOPE on 01707 333 396 -or- refer to www.nvelope.com/cladding-project-checklist-static-thermal-calculations.html These terms and conditions and any dispute arising in connection with them (including but not only contractual disputes) are governed and construed in accordance with the laws of England and you consent to the exclusive jurisdiction of the courts of England.